Ernest Hemingway was born on July 21, 1899, in Oak Park, Illinois, a Chicago suburb. He lived a life of adventure and became one of the most influential authors of fiction during the 20th century. Most of his writing was done between 1925 and 1955. His total collection includes seven novels, six short stories, and two works of non-fiction. Ernest Hemingway was raised in his birthplace of Oak Park, IL. His father was a doctor and his mother was a musician. It was his dad who instilled his sense of adventure and a fondness for the outdoors during their many hunting and fishing trips. 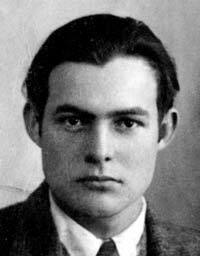 Hemingway was a boxer and football player in high school. He was also an excellent English student and a member of the school band. He was also a frequent contributor to his school’s newspaper. With no true aspirations to attend college, Hemingway took a job as a cub reporter for the Kansas City Star in 1917. Subsequently, he returned to Chicago and also lived in Toronto and Michigan for a time while in his 20s. In 1918, Ernest heeded a call for ambulance drivers in Italy during World War I. He suffered severe wounds as the result of mortar fire and spent six months in a Milan hospital recuperating. After recovering, he returned to the U.S.
As a reporter for the North American Newspaper Alliance, he travelled to Spain in 1937 to file reports on the Spanish Civil War. He wrote the only play of his career, The Fifth Column, during a period when Madrid was being bombarded. Hemingway was present at the Battle of the Ebro and was one of the last journalists to depart the fighting. Hemingway again entered a war zone when he was present at the Normandy landing during World War II. He was then a part of the liberation of Paris towards the war’s end. His wartime experiences led to many of the books he wrote, including A Farewell to Arms. Hemingway’s first novel was The Sun Also Rises, which was published in 1926 following his relocation to Paris as a foreign correspondent. For Whom the Bell Tolls was completed in 1939 and was based on his experiences as a journalist covering the Spanish Civil War (1936-1939). In 1952, Hemingway went to a safari in Africa where he was involved in two plane crashes. While surviving both, they altered his physical well-being for the rest of his life. In 1959, he purchased a home in the remote regions of Ketchum, Idaho, where he would die of a self-inflicted gunshot wound to his head in 1961 at the age of 61. The Sun Also Rises, written in 1926, was primarily about bullfighting in Pamploma, Spain. A Farewell to Arms, a 1929 novel depicting the Italian involvement in World War I. For Whom the Bell Tolls, which was published in 1940 describing the journey of a young American and his exploits during the Spanish Civil War. The Old Man and the Sea was the last work of fiction published during Hemingway’s lifetime. This is the story of an aged fisherman and his own epic battle with a giant marlin in a remote section of the Gulf Stream. Ernest Hemingway established residences in Key West, Fl. in the 1930’s and Cuba during the 1940’s and 1950’s. He was married 4 times and had 3 sons.